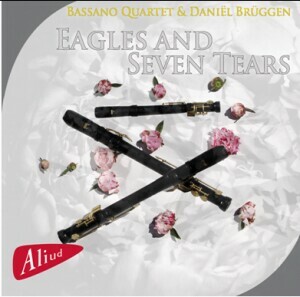 After the successful first CD ‘Torres del Alma’ with quartets from the Spanish Renaissance, the idea arose to create a second CD with new music and arrangements for the Eagle recorder and a unique performance of the ‘Lachrimae, or Seaven Teares’ of John Dowland with guest musician Daniël Brüggen. With this recording we aim to explore the extremes of the recorder quartet sound and forge new paths. Along with the medieval Aquila altera, the classical flute quartets of Haydn happen to sound excellent on a modern Eagle recorder. I arranged a saxophone quartet from Bob Mintzer and wrote a Chorale for two Eagle altos, a tenor and a bass. is the Sub Contrabass that is 3 metres long and the highest is a soprano in c’’’. A 16th Century sound has been transformed for the 21st Century!